Every bridal magazine you pick up is brimming with organizational tips, checklists, menus and every last detail a bride needs to attend to for the most magnificent day possible. Here are a few thoughts about planning and the bigger picture that sometimes get overlooked. 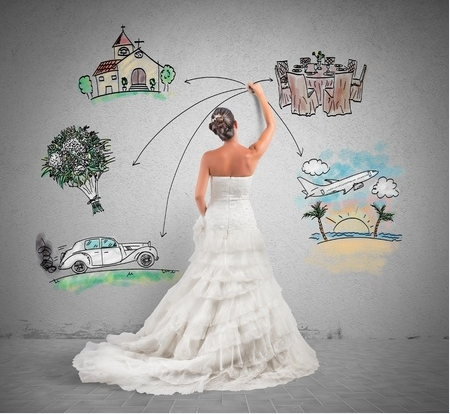 Isolate the most important factors of your wedding, and everything else will fall into place. Is the location most important? The date? Determine what you can’t compromise on, and build your plan from there. Don’t be afraid to let people know what’s not negotiable, and don’t deviate unless it’s because you want to. An Honor – or a Burden? The ring is on your finger, you’re crazy in love, and over lunch with your best friend, you ask her to be your maid of honor. What if she says no? It’s happening more often these days, according to The Davis Enterprise. “Brides place such demands on their bridesmaids these days that it is not uncommon for them to decline, even when it’s one of their best friends. Not only is the financial responsibility of being a bridesmaid staggering, but the time commitment demanded by some brides is also daunting,” the story said. As you ask friends to be an important part of your special day, be upfront with them about obligations, costs, time involved and anything else that might cause a problem down the line. If you’ll be using a credit card for your wedding costs, why not reap a little goodness back? So many cards now offer cash back, airline miles, online store credit or other benefits. Even with a simple backyard ceremony, you’ll still be spending, so make sure your credit card gives you something back. This tip comes from The Knot magazine, where they’re reporting that your wedding budget should follow this formula: 48 to 50 percent of total budget to reception; 8 to 10 percent for flowers; 8 to 10 percent for attire; 8 to 10 percent for entertainment/music; 10 to 12 percent for photo/video; 2 to 3 percent for invitations; 2 to 3 percent for gifts; and 8 percent for miscellaneous items like a wedding coordinator. It’s essential to allocate an extra 5 to 10 percent of your money for surprise expenses, like printing extra invites because of mistakes, additional tailoring needs, umbrellas for a rainy day and ribbons for the wedding programs. The magazine also offers an interactive budget tool to help you plan. When it comes time for choosing your wedding officiant anywhere in the greater Temecula area or throughout Southern California, I would be delighted to help you create the perfect ceremony. Contact me today by calling or texting 909-730-7342!